(TibetanReview.net, Aug17, 2014) – China inaugurated on Aug 15 a second railway line in Tibet Autonomous Region without much fanfare apparently keeping in view the geopolitical sensitivities in neighbouring India over the highly strategic project’s completion. The Lhasa-Shigatse Railway line is an extension of the Qinghai-Tibet Railway which China inaugurated with high-profile ceremonies at both the ends in Jul 2006. The new line began its passenger and freight services the next day. 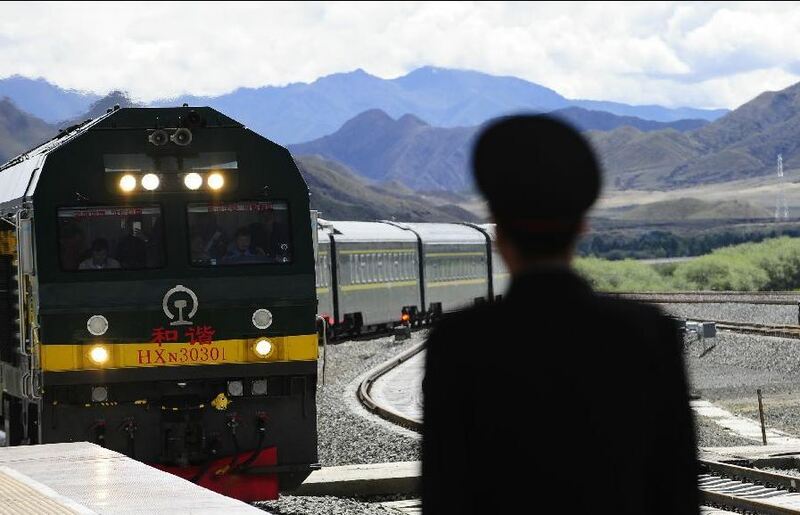 Earlier, CNN.com Aug 4 cited Suolang Deji, an officer with Shigatse’s tourism department, as saying the initial privilege of travelling on the new railway line will be given only to Chinese from mainland China, with the first batch being a tourist group from Shandong Province. While Tibet is fully open for visitors from China, it remains tightly controlled for other foreigners as well as even Tibetans whose movements are tightly restricted to their local areas due to political reasons. It was not clear when the Lhasa-Shigatse railway line will open for other travellers. With an investment of 13.2 billion yuan (US$2.1 billion), the 251-kilometer high-elevation railway will cut travel time between Lhasa, the regional capital, and Shigatse, the second-largest city in the region, from five hours (by bus) to about two hours, reported China’s official China’s Daily newspaper Aug 16. The single-track alignment is designed for a maximum speed of 120 km/h. Tibetans, who continue to oppose the Chinese occupation rule, fear that the new railway line will spur an influx of long-term Chinese migrants, whose overwhelming surge threaten the region’s cultural and ethnic identity, and the ongoing reckless plundering of Tibet’s rich natural resources. Neighbouring India also views the project as a threat as it will facilitate rapid movement of Chinese troops and military assets in times of hostility. China insists, however, that the project is meant to facilitate economic development and improve people’s livelihood by providing modern transport and promoting tourism. At a cost of 50,000 yuan per meter (ft), the railway lines is the most expensive ever built in China, because of the harsh terrain it traverses, making it necessary to build numerous bridges and tunnels, Reuters Aug 15 cited China’s official Xinhua news agency as saying. The 29 tunnels and 116 bridges total around half of the railway line’s length, according to railwaygazette.com Aug 15. It also passes through the 60-km Yarlung Zangbo Grand Canyon. China plans further extensions of the railway line, to Nyingtri over 433 km and Yatung by the year 2020. The latter is located just across the borders of Bhutan and the Indian state of Sikkim while the former is close to the state of Arunachal Pradesh, claimed by China as southern Tibet. China also plans to connect Kunming, the capital of Yunnan Province, with Lhasa by another railway line in the near future.